I began my career in information technology. Coming out of college, I joined a large IT consulting firm where I was taught how to code in the predominant technology of the day - COBOL. While I was brand spanking new to coding, the mechanics of programming in COBOL wasn't a big challenge; it was simply another language that had its own particular structure and set of rules. What was far more important than being an expert coder was for me to be an expert at understanding the organization I was working for; working collaboratively across departments, and with a variety of roles, to properly establish and prioritize the business objectives. And then, only then, did I actually get down to developing the code to meet those objectives. Ultimately, it was my effectiveness at marrying the business analytics with the technical output that helped me to advance my career. 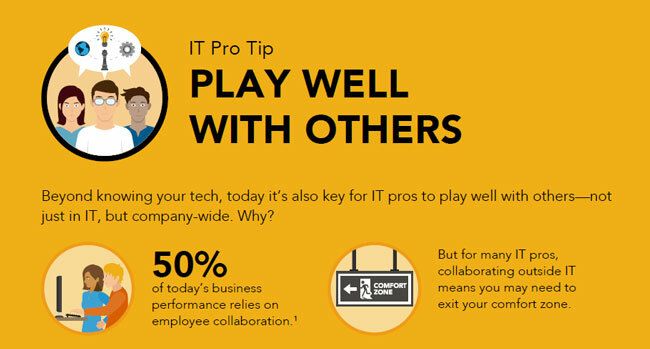 Graphic source: “Play Well with Others,” Capella University, 2016. 1 “The Looming IT Crisis that Might Surprise You,” CEB. Flash-forward 25 years and technology skills are more important than ever. While I have no doubt that there may still be a few buggy whip companies out there, technology has become an integral part of every business, from ensuring the core infrastructure is secure to using big data to understand customer purchase patterns. Graphic source: “Wrangle Big Data” Capella University, 2016. 1 “Big Data: 20 Mind-Boggling Facts Everyone Must Read,” Forbes, September 2015. Yet while the underlying technology continues to change (if you are still programming in COBOL, you have my condolences), the importance of understanding how the technology drives business goals has not. So if you're looking to advance your career in IT, it's critical that you have a solid foundation in both the latest technologies and the soft skills you need to get the job done. 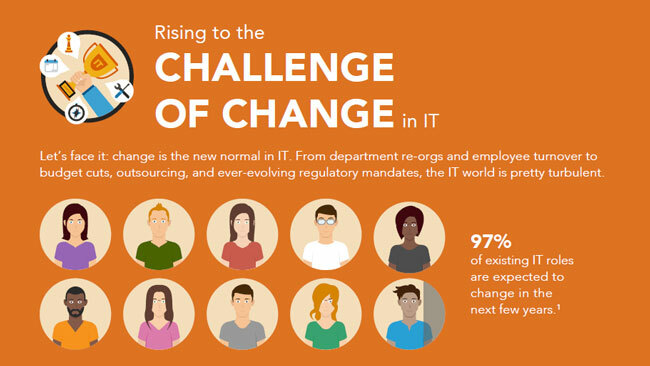 Graphic source: “Rising to the Challenge of IT” Capella University, 2016. 1 “The IT Talent Crisis Nobody is Talking About,” CEB, 2014. It's what the CEB defines as the "Twelve Competencies of a World-Class IT Professional": Business Results Orientation; Communication; Influence; Relationship Management; Teamwork; Creativity; Learning Agility; Organizational Awareness; Analytic Ability; Decision Making; Prioritization; Process Orientation. Understanding your relative strengths in each of these areas will help you identify the most appropriate short and long-term career development action plan. Capella University is helping us evaluate our current strengths in these twelve areas by making the full CEB IT Talent Assessment available for free to our readers. You can take the CEB assessment here for your personalized development plan. I'll be taking the assessment and telling you about my results in a future article. With your personal plan identified, you can chart out the educational development you need to put that plan into action. Of course, if you're a working professional this is easier said than done. Taking time off from work to complete your bachelor's or master's may be too much to ask. Even earning a certificate for specialized skills from your local community college means extra time spent traveling to and from classes. If this sounds like your situation, an online program from Capella University may be the solution. With flexible online classrooms and support, Capella ensures you can work on your courses at a time and place that fits your life. Accreditation ensures that your degree is recognized by employers, professional associations, and other accredited institutions of higher education. Capella is an accredited online university, ensuring every degree they award is relevant, recognized, and respected. Learn more about how Capella can help you take your IT career to the next level through its comprehensive undergraduate, graduate and certificate degree programs. IT professionals speak out! What is the most challenging thing about you role? Did you get any surprises from your CEB assessment here? Tell us in the comments below. See graduation rates, median student debt and other information at http://capellaresults.org/outcomes.asp This is a sponsored conversation written on behalf of Capella University.